PDB rendering based on 1dsz. 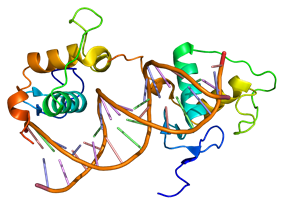 Retinoic acid receptor beta (RAR-beta), also known as NR1B2 (nuclear receptor subfamily 1, group B, member 2) is a nuclear receptor that in humans is encoded by the RARB gene. Retinoic acid receptor beta has been shown to interact with NR4A2. ^ Mattei MG, de Thé H, Mattei JF, Marchio A, Tiollais P, Dejean A (October 1988). "Assignment of the human hap retinoic acid receptor RAR beta gene to the p24 band of chromosome 3". Hum. Genet. 80 (2): 189–90. ^ Perlmann T, Jansson L (April 1995). "A novel pathway for vitamin A signaling mediated by RXR heterodimerization with NGFI-B and NURR1". Genes Dev. 9 (7): 769–82. Dejean A, de Thé H (1990). "Hepatitis B virus as an insertional mutagene in a human hepatocellular carcinoma". Mol. Biol. Med. 7 (3): 213–22. Sun SY (2004). "Retinoic acid receptor beta and colon cancer". Cancer Biol. Ther. 3 (1): 87–8. Saba N, Jain S, Khuri F (2004). "Chemoprevention in lung cancer". Current Problems in Cancer 28 (5): 287–306. Klein O, Grignon Y, Civit T et al. (2006). "[Methylation status of RARbeta gene promoter in low and high grade cerebral glioma. Comparison with normal tissue. Immuno-histochemical study of nuclear RARbeta expression in low and high grade cerebral glioma cells. Comparison with normal cells. 48 tumors]". Neuro-Chirurgie 51 (3–4 Pt 1): 147–54. Katahira M, Knegtel RM, Boelens R et al. (1992). "Homo- and heteronuclear NMR studies of the human retinoic acid receptor beta DNA-binding domain: sequential assignments and identification of secondary structure elements". Biochemistry 31 (28): 6474–80. Berrodin TJ, Marks MS, Ozato K et al. (1992). "Heterodimerization among thyroid hormone receptor, retinoic acid receptor, retinoid X receptor, chicken ovalbumin upstream promoter transcription factor, and an endogenous liver protein". Mol. Endocrinol. 6 (9): 1468–78. van der Leede BJ, Folkers GE, Kruyt FA, van der Saag PT (1992). "Genomic organization of the human retinoic acid receptor beta 2". Biochem. Biophys. Res. Commun. 188 (2): 695–702. Prentice A, Matthews CJ, Thomas EJ, Redfern CP (1992). "The expression of retinoic acid receptors in cultured human endometrial stromal cells and effects of retinoic acid". Hum. Reprod. 7 (5): 692–700. Shen S, Kruyt FA, den Hertog J et al. (1992). "Mouse and human retinoic acid receptor beta 2 promoters: sequence comparison and localization of retinoic acid responsiveness". DNA Seq. 2 (2): 111–9. de Thé H, Vivanco-Ruiz MM, Tiollais P et al. (1990). "Identification of a retinoic acid responsive element in the retinoic acid receptor beta gene". Nature 343 (6254): 177–80. Hoffmann B, Lehmann JM, Zhang XK et al. (1991). "A retinoic acid receptor-specific element controls the retinoic acid receptor-beta promoter". Mol. Endocrinol. 4 (11): 1727–36. de Thé H, Marchio A, Tiollais P, Dejean A (1988). "A novel steroid thyroid hormone receptor-related gene inappropriately expressed in human hepatocellular carcinoma". Nature 330 (6149): 667–70. Brand N, Petkovich M, Krust A et al. (1988). "Identification of a second human retinoic acid receptor". Nature 332 (6167): 850–3. Benbrook D, Lernhardt E, Pfahl M (1988). 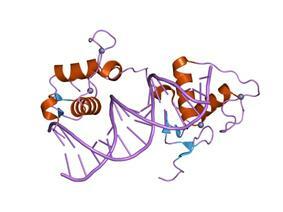 "A new retinoic acid receptor identified from a hepatocellular carcinoma". Nature 333 (6174): 669–72. Dejean A, Bougueleret L, Grzeschik KH, Tiollais P (1986). "Hepatitis B virus DNA integration in a sequence homologous to v-erb-A and steroid receptor genes in a hepatocellular carcinoma". Nature 322 (6074): 70–2. Si SP, Tsou HC, Lee X, Peacocke M (1995). "Effect of cellular senescence and retinoic acid on the expression of cellular retinoic acid binding proteins in skin fibroblasts". Exp. Cell Res. 219 (1): 243–8. Houle B, Pelletier M, Wu J et al. (1994). 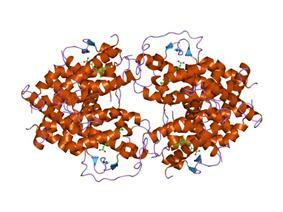 "Fetal isoform of human retinoic acid receptor beta expressed in small cell lung cancer lines". Cancer Res. 54 (2): 365–9. Knegtel RM, Katahira M, Schilthuis JG et al. (1993). 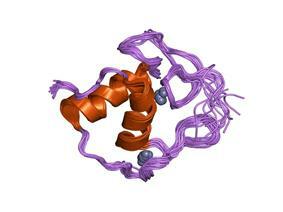 "The solution structure of the human retinoic acid receptor-beta DNA-binding domain". J. Biomol. NMR 3 (1): 1–17.